I write Christian historical romance set in post-Civil War Texas, but I'd like to "go off my brand" this month to talk about Morgan's Raid, since it was the only part of the Civil War that took place in Ohio, where I now live. And it took place exactly one hundred fifty years ago this month. It was the northernmost invasion by any part of the Confederate forces and the longest continuous march by so large a force in the Civil War. 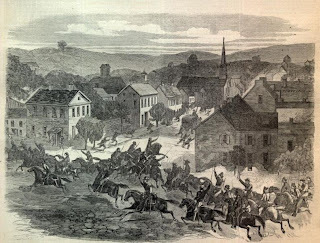 It began on June 11 when General John Hunt Morgan, who'd grown up in the border state of Kentucky, and a force of 2000 men set out across Tennessee and swept across Kentucky and Indiana before crossing into Ohio just north of Cincinnati. His goals were twofold: to terrorize the populace and to divert as many Union Forces as possible from middle and eastern Tennessee, where the Yankees were trying to cut important supply routes of the Confederacy. He accomplished the latter goal, for at one point as many as 8000 Union troops were pursuing him. He accomplished the other goal too, burning bridges, canal boats, and strategically important buildings, tearing up railroad tracks, stealing horses and food, looting stores. Cincinnati declared martial law. Yet Morgan had a reputation for chivalry as well. His men were commanded not to hurt women, children, and anyone who did not try to harm them first. Private property was usually untouched—though stories abounded of civilians going to elaborate lengths to conceal valued goods. Loaves of bread were hidden in pillows, money in hems of ladies' skirts. In one instance, silverware was hidden up a chimney, but Morgan's men came in and demanded a meal, forcing the family to light a fire in the fireplace. Something spooked the raiders, though, and they took off quickly, so the silver was rescued. In another instance, a man hid the family horses in his parlor, only to have the raiders knock on his door. He lied, saying there was a child with smallpox in the house and the raiders left. During this time and for long afterward mothers hushed their children by saying Morgan would get them. 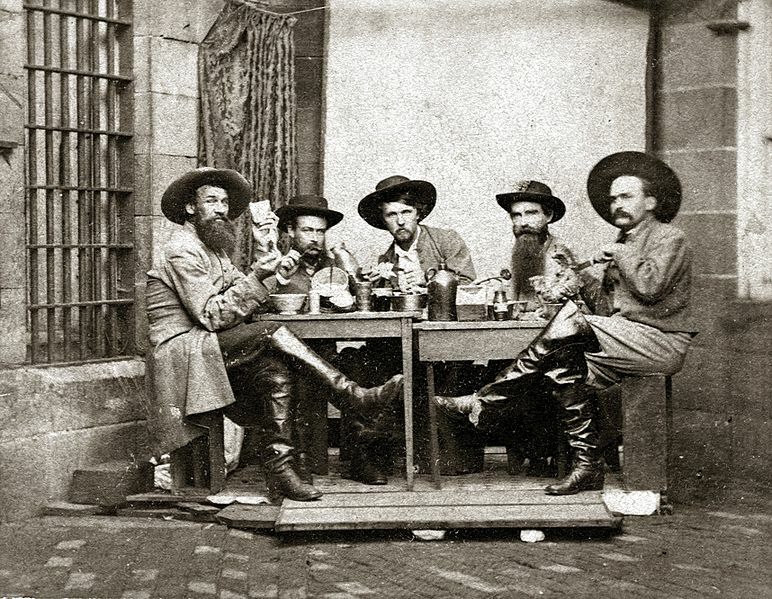 Ohio families took in wounded or ill raiders on several occasions and nursed them back to health. On one occasion, a raider fell in love with an Ohio girl he met only briefly and returned to marry her after the war. I'd love to write that story some day! 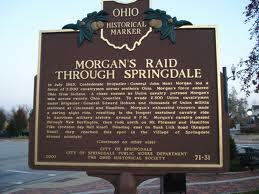 The raid lasted six weeks, only two of which took place in Ohio. Morgan assumed he'd be able to cross out of enemy territory at Buffington Island on the Ohio River, into West Virginia, but the river was swollen by heavy rain, and Union forces were waiting for him there, along with federal gunboats. Many of his men were captured there or killed. Morgan and some of his men fled west and then northward, trying to find a safe place to cross, but he was caught on July 26, 1863. He and several of his men were placed in the Ohio Penitentiary at Columbus Ohio—from which he and six of his officers escaped by burrowing through one of their cell floors and finding a ventilation shaft, which took them to the prison yard. There they escaped over the walls. Morgan daringly walked to the station and took a train that night to Cincinnati, even speaking to a Union officer on board! But Morgan didn't find a warm welcome back among the rebel forces of General Bragg. 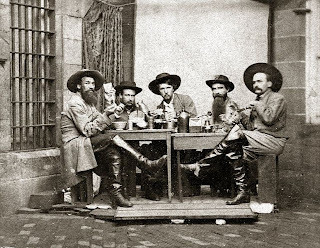 He took to raiding again, this time not bothering to control his raiders, which caused the Confederate Army to investigating the possiblility of charging him with criminal banditry and remove him from command. But before that could happen, in July 1864, Union forces surprised him in a raid in Tennessee and the dashing Cavalier of the South, Brigadier General John Hunt Morgan was killed. 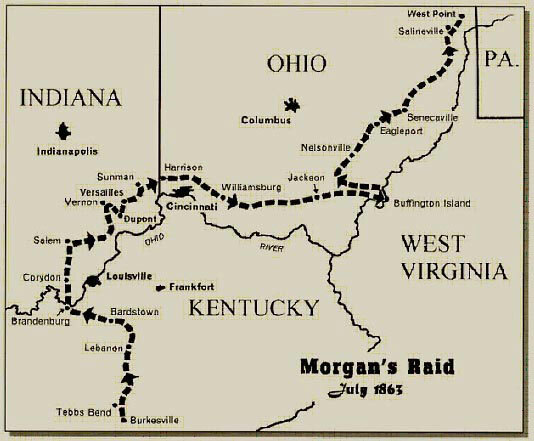 You can follow much of the trail of Morgan's Raid, thanks to the Ohio Department of Transportation and local partners in Hamilton Country, where the raid began. It's called the John Hunt Morgan Heritage Trail, and it's dotted with 56 interpretive signs. 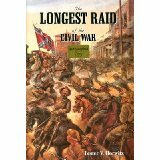 In addition, there is a Pulitzer prize- winning book written about the raid by Lester Horwitz, THE LONGEST RAID OF THE CIVIL WAR, arguably the most comprehensive book on the subject. Great information, Laurie! You must write that story! I love your books. Loved this post, Laurie. He's one of the many colorful figures of the war, and one of the many reasons I love this time so much. Great post. Kathleen, thank you. I always thought John Hunt Morgan had a rather romantic aura too. Hope all is well at your house. Interesting post. Since the hero of my post civil war WIP is from Ohio and his brother was killed in the war, I was wondering where that might happen. This is perfect, though you didn't mention any Union soldiers getting killed, I assume they did. Elaine, I'm sure Morgan's men accounted for more Union deaths than vice-versa. They were reputed to be great fighters. I didn't find any source that mentioned Union losses specifically. Thanks for commenting! I hadn't heard this story before, Laurie. It reminds me a bit about tales of the Swamp Fox. Very interesting! Thanks, Vickie. Some times I think there aren't nearly as many "dashing" figures in Ohio history as there are in the west, but if one looks a little...Thanks! Laurie, thank you for sharing. I love these sort of tidbits. "Bleeding Kansas" was certainly a scary, interesting time too. I'd like to see a story like that. Laurie, what fascinating information. It really brings the past alive. I can just picture the horses in the parlor. Thanks, Margaret. I was lucky to find an article that gave such interesting tidbits in commemoration of the 150th anniversary. Appreciate your commenting!